Having an alarm in place to be triggered in the event of a fit is a great way of keeping an eye on loved ones over night. But it is not fool proof. Simple problems can occur that can result in a very dangerous situation. For example, what if you have a bed sensor mat in place and are waiting to hear the alarm. But no alarm sounds and this is because the mat has slipped between the slats on a bed and is monitoring nothing but the dust movement. This is a huge problem. You need to be reassured of the safety and reliability of the mat, knowing that you can sleep easy and those you care for are being monitored. 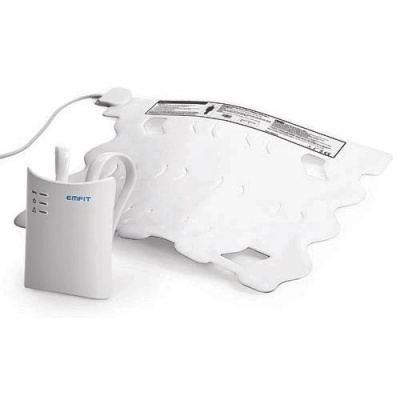 The Emfit Dynamic Bed Sensor Mat is designed to take away this worry and concern. Coated in a sheet of PVC, the rigidity of the mat stops it from being able to slide out of range during the night. The Bed Sensor is designed for use with the Emfit Tonic Clonic Seizure Monitor. 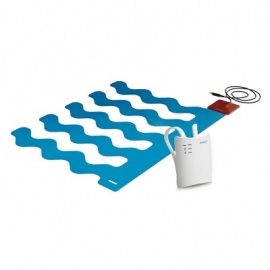 The L-4060SLC mat is the same as the sensors used in the bed sensor. This one, however, is sealed within a PVC sleeve that enables it to be used on a bed with a slatted framework. This sleeve makes the sensor more rigid and therefore stops it from falling through the slats on the bed. It has the same sensitivity and same performance, but consists of a more rigid structure. This means that the mat is unable to move or change angle in the same way as the standard mat and is therefore unable to slide through the gaps in the slats of a bed-frame. The mat is positioned under the mattress and monitors the movements of the sleeping person through patented sensor technology. When it detects fast/sudden movements for longer than the pre-set delay, the alarm is triggered. There is no weight limit and the mat is sensitive enough to work for a small child, so the monitor is appropriate for anyone who requires it.